Our infrastructure is centered around the software development process. We use Jenkins for production build automation and compilation, as well as test automation, Git for version control, and Postgres and MySQL databases for content management. Our engineering team has nearly 50 virtual desktops using Horizon View as development workstations. All told, it’s a mix of Linux and Windows systems all running on vSphere 6, backed up with vSphere Data Protector (VDP). The cluster that Chris and I talked the most about is a 5-host cluster with over 100 VMs, hosted on a NetApp hybrid array. Chris recently installed Infinio’s version 3 release on our infrastructure, allocating 28GB of RAM and a 225GB SSD drive on each host. The aggregate performance on one of our clusters over a work-week. The purple line is the storage latency, and the blue line is the VMs' realized latency with Infinio. our Jenkins VM. Latency is below 1ms. Finally, Chris recently added more RAM to each host in the cluster, with the hopes of increasing performance. 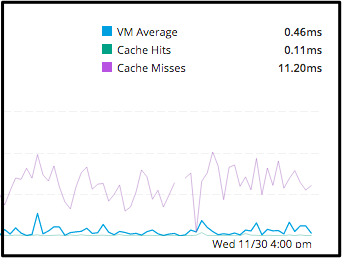 Adding just 10GB per host increased the cache hits by another 5%. That boost will lead to even more improved build, test, and backup times too.